Google Now gives you a short overview of information it believes is relevant to you right now. It can interpret a lot of things from your search history as well. If you've been searching for, let's say, your favorite football team, Google Now will prepare a card showing you the next match the team is playing and will provide you score updates once the game begins. With the help of Android's Voice Actions, which come as part of Jelly Bean, can handle advanced stuff such as sending messages (SMS or email), initiating a voice call, asking for directions, taking a note or opening a site. You can also launch apps, check and manage your calendar and look for nearby places of interest and stuff like movie openings in theaters. Google Now on the Huawei Ascend P6 gets activated with an upward-swipe from the virtual navigation bar. The gesture now works from the homescreen as well, unlike on the Ascend Mate where you could invoke Google Now only from an app. You can either type or talk to it and the app will give you one of its info cards (if available) and read you its contents aloud (you can disable this in the app settings). If there's no card to answer your question, Google Now will simply initiate a Google web search instead. The Ascend P6 is powered by Huawei's own K3V2 chipset. There are four 1.5GHz Cortex A9 cores, a 16-core GPU and 2GB of RAM. The Cortex A9 cores are already a dated piece of tech, but the quad-core setup is still quite capable of keeping Android running smoothly on a 720p screen. The Huawei Ascend Mate and Samsung Galaxy S III, for instance, use similar processors and they still gets the job nicely done without any hiccups. Starting off with BenchmarkPi and Linpack, the Ascend P6 posted pretty good scores, on par with the Huawei Ascend Mate and the Galaxy S III. Of course, it wasn't able to match the more recent flagships in our database. 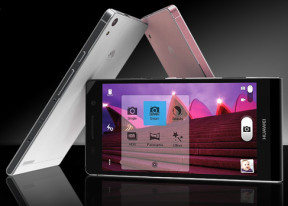 When it comes to the multiple-core performance, the Huawei Ascend P6 behaved similarly to its quad-core Cortex-A9 powered rivals. We've added some GPU benchmarks for good measure to test out the undisclosed 16-core graphics chip inside the Ascend P6. Since we saw the same GPU in the Ascend Mate, we already knew the GPU isn't anything spectacular, and there were no surprises this time around. We also ran the BrowserMark 2 benchmarks, but the score is nothing to write home about.